They like to call it a “flower museum” and for someone who loves flowers as much as I do, it is exactly that. But the Botanic Garden is actually a living creatures’ museum, because there are also different types of trees, shrubs, medicinal and aromatic plants and herbs from around the world. The variety of flowers is so vast, that I recommend a visit during spring time to see them in full bloom. 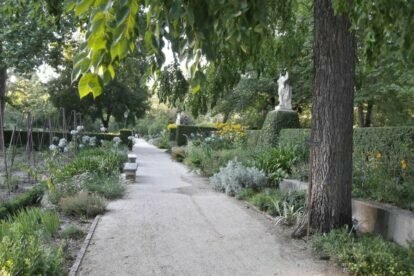 You will also find statues, a pond with ducks and few classical buildings where exhibits and workshops are held with regularity, as research on botany is as important in this garden as the flora on display. Its herbarium is the largest one in Spain and there is also a Japanese garden with bonsais. The bonsai garden is a must. Another must are the greenhouses, where they keep and exhibit tropical plants and cacti. Maybe it’s because the tropical plants remind me so much of my home country (Venezuela), but the green color explosion and the exotic flowers that you can find here are spectacular. I would say that this spot alone is worth your visit. Do not forget that the garden is not a park, so picnics are not allowed, but you can enter with your own food as there are no cafeterias inside. As I said, spring is the best time of the year to visit: it is so photogenic!